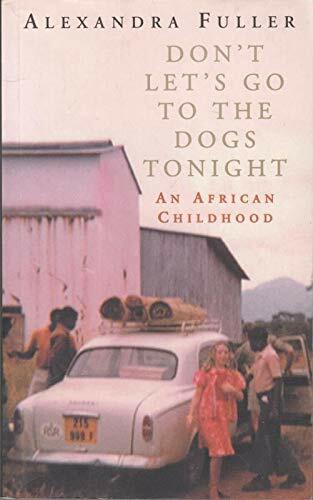 Don’t Let’s go to the Dogs Tonight is a wonderfully evocative memoir of Alexandra Fuller’s African childhood. Fuller regards herself "as a daughter of Africa", who spent her early life on farms in Zimbabwe, Malawi and Zambia throughout the turbulent 1970s and 80s, as her parents "fought to keep one country in Africa white-run", but "lost twice" in Kenya and Zimbabwe. This is a profoundly personal story about growing up with a pair of funny, tough, white African settlers, and living with their "sometimes breathlessly illogical decisions", as they move from war-torn Zimbabwe to disease and malnutrition in Malawi, and finally the "beautiful and fertile" land of Zambia. Central to Fuller’s book is the intense relations between herself and her parents, a chain-smoking father able to turn round any farm in Africa, her glamorous older sister Vanessa, and the character who sits at the heart of the book, Fuller’s "fiercely intelligent, deeply compassionate, surprisingly witty and terrifyingly mad" mother.